This personalized 30-inch laminated wood paddle is the perfect addition to any nautical themed room or porch. Made in the USA and ready to hang inside or out. Choose your text, including color and font style. As of this post, the Boat Name Paddle is on sale for $33.99, including personalization. More info. Made of sail cloth and with a zipper top, this petite tote bag is as practical as it is adorable. It is a great nautical alternative to a traditional handbag. 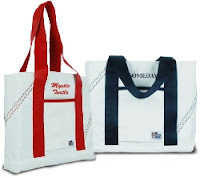 It comes in white with your choice of red or dark navy handles and trim. 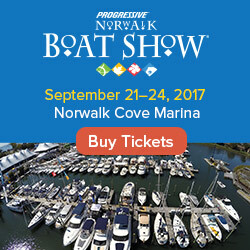 Best of all, you can get your boat name (or any text such as Mom's monogrammed initials) embroidered above the outside pocket for a small fee. As of this post, the tote is on sale for $29.99 (blank). Add $10 for embroidery. More info. 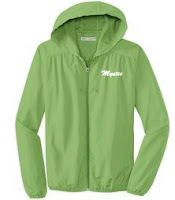 With simple, classic styling, this super lightweight jacket will shield her from breezes and drizzle, and it's easy to stuff into a tote when the sun comes back out. And right now you can get this jacket, including her boat's name embroidered on it, for under $30. More info. 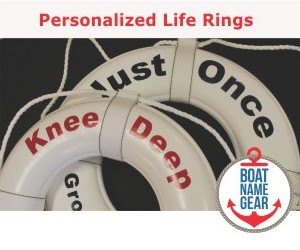 For a limited time, check out all the deals at Boat Name Gear's Mother's Day Boutique. Happy Mother's Day!